You experienced it, heard of it, or are about to wish you went to it. The Antiques Garage was a market unlike any other; it created such a following and such a reputation that, despite closing, its long legacy and vibrant history still live on. The Antiques Garage thrived in Chelsea for 20 years as the first indoor flea market in New York City. True to its name, the market was in a two-story concrete parking garage and known as the go-to destination for some of the best antiques in the city. While looming threats of an impending closure lingered on for years, it wasn't until late June 2014 that the Antiques Garage finally closed its doors for the last time. The home to hundreds of vendors, thousands of shoppers and millions of unique pieces of merchandise the Garage created a sub-culture within the city that quickly drew a following fueled by the energy of the market. Join us as we unwrap the story behind the Antiques Garage, including its history, vendors, shoppers, merchandise, location and cult culture that made it the quintessential market weekend after weekend. Now closed, this beloved indoor flea market is still remembered for its legacy of 20 years in Chelsea. The Antiques Garage thrived in Chelsea for 20 years as the first indoor flea market in New York City. True to its name, the market was in a two-story concrete parking garage and known as the go-to destination for some of the best antiques in the city. While looming threats of an impending closure lingered on for years, it wasn't until late June 2014 that the Antiques Garage finally closed its doors for the last time. 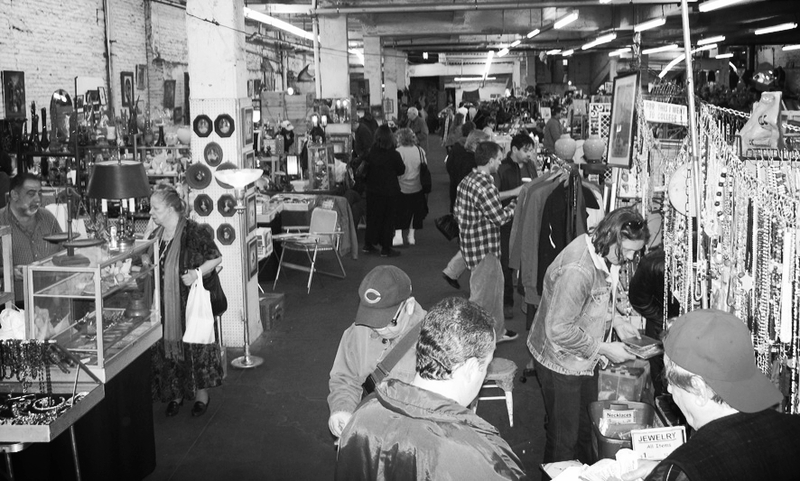 The home to hundreds of vendors, thousands of shoppers and millions of unique pieces of merchandise the Garage created a sub-culture within the city that quickly drew a following fueled by the energy of the market. Join us as we unwrap the story behind the Antiques Garage, including its history, vendors, shoppers, merchandise, location and cult culture that made it the quintessential NYC flea market weekend after weekend. Where Did the Garage Go? The Garage Door Has Closed For Good, Now What? Plus...check out this Homage to The Garage from the show Flea Market Minute with Bob Richter! Thanks Bob!